The World-Wide Web constitutes an activity space in which people set up and host places that are visited by others. To render web places such as homes, sites, and portals attractive for visitors has become a fundamental concern. However, once a web presence is established, hosts usually maintain little or no awareness of visiting activity. This is not due to any fundamental lack in information - standard HTTP servers log plenty of it - but rather a problem of presenting acitivity-related information in suitable ways. In this paper we describe a system platform and methods for support of visitor awareness based on integration of ambient information displays with the World-Wide Web. Web activity, Visitor awareness, Web awareness, Augmented reality, Ambient media, Web-based interaction. The World-Wide Web is primarily perceived as information space but can also be considered as activity space. From this perspective, it constitutes a space in which people stake out areas that they furbish with information. As hosts of such information territory they commonly have an active interest in attracting visitors, as demand for one's information is the dominant success criterion for a presence in the Web. Hence it is straightforward to assume that hosts in the Web should have a strong interest in visiting activity in their territory, and particularly in who their visitors are. In this paper we point out problems associated with maintaining awareness of activity in the web, describe a system platform for web awareness, and report experience with specific techniques for awareness support. In our view of the web as activity space, the actors are hosts on the one side and visitors on the other side. Hosts are individuals, groups or organizations that create and maintain public information areas in the Web - homes, sites, portals, or generally places. Visitors are individuals that enter places to access information. Commonly, the hosts' primary concern in maintaining a place in the web is to attract visitors, be it to support business objectives, to promote achievements and knowledge, or to express ideas, viewpoints and sentiments. Whether the design process of a web presence is formal or informal - there is generally some consideration of whom to target and how to target them best. Yet, once a place is established in the web, their hosts usually maintain little or no awareness of who is visiting. This is quite in contrast to comparable situations in the real world, in which individuals, groups and organizations design places such as home environments, reception areas, showrooms, lab tours, exhibition booths and so on to attract visitors. In these real places, hosts maintain a high degree of visitor awareness. Depending on situation, this can span from general awareness of how busy a place is and of how popular specific areas within a place are, to who the visitors are and what they are specifically interested in. In web places this is fundamentally different; visitors come and go unnoticed, and the fact that a place has visitors is - if at all - reduced to notions of hit rates (a "hit" denoting access to a web resource). The web infrastructure is not to be blamed for how little visitor awareness has developed so far. With standard web server technology it is possible to capture rich information on visiting activity. It is straightforward to track access to information resources, and to derive activity patterns that occur in a web place. Often it is also possible to track down where a visitor is from, and to which place they have been before. And sometimes, even more specific visitor information is available, for instance from Cookies or from explicit authentification. The problem, however, is that such information is not readily available to hosts. Instead it is usually captured in log files in a presentation that does not lend itself to casual inspection, even if the log is directly accessible to hosts. Log files do support in depth post hoc analysis of web activity, for instance, to produce statistics that relate number of hits to web resources, to domains from where hits originate, to types of browsers used and so on. Such statistics are very valuable to track overall performance of a web place and to support web management decisions. However, they do not support casual awareness of ongoing activity, as they are neither timely and nor easy to digest. The challenge for support of visitor awareness is to provide web hosts with web activity information in a suitable presentation. General requirements for presentation of awareness information are timeliness, use of suitable abstractions, and casual accessibility. An interesting approach to provide these qualities is to create awareness displays in the ambient environment as opposed to on the computer screen where such displays would compete with other applications for screen real estate. To facilitate ambient views of web activity, we have developed a system platform for integration of ambient media in web-based environments. Based on this platform, we have developed three specific methods to support visitor awareness at different levels of abstraction, all leveraging concepts of ambient interfaces and augmented reality. Ambient interfaces have the quality of engaging users both at the center and the periphery of their attention , and augmented reality enables information visualization in the real world. In this paper we will first provide an analysis of web activity information available in standard web infrastructure, of awareness support systems as investigated in the area of computer-supported collaborative, and of the state of the art in ambient interfaces for peripheral awareness. The analysis will be followed by a description of the system that we have developed as platform for web awareness, and of the specific ambient media environment that we have implemented on this platform. In section 4, we will discuss experience gained with two web awareness methods that we introduced in , i.e. ambient links that support notification and web activity views that support overview and comparison. In section 5 we will discuss the design of a new method - glances into the visitors' sites - that provides web hosts with more detailed information on who is visiting. In the following subsections we will first analyze what kind of activity-related information is available in web environments, and to how this information is presented and used. The analysis then turns to related work in the area of computer-supported collaborative work, and finally to research into ambient displays for peripheral awareness of information. The standard web infrastructure underlying the places that hosts maintain in the web does support the capture of rich information related to web visitor activity. It can easily be tracked which pages are accessed by a visitor, which path is taken through a site, and how much time is spend on each page (roughly). Usually it can be found out where a visitor is from based on their IP address or domain name (provided there is no proxy indirection), and where they have been before (provided there is no referrer indirection). Sometimes even the username is available from Cookies or explicit authentication. Further visitor information is available on the software used (operating system and type of browser), the viewing preferences (e.g. with or without images), and possibly the problems encountered on a visit (e.g. access restrictions and timeouts). This wealth of activity-related information is captured in log files, however, in a presentation that is not easily accessible to the authors or hosts of a web place. The low level of abstraction in log file entries implies an information overload. The information is not easy to digest, and it is particularly difficult to abstract it to a more general impression of web activity. Of course, there is a wide range of analysis tools to process log file information to generate abstractions for a range of purposes . For example, web activity information is commonly compiled into reports that summarize visits over certain periods of time, typically days, weeks and months. Such reports may serve purposes such as business justification and service optimization, but are not available in a timely fashion which is prerequisite for awareness support. Other abstractions of activity-related information are developed for instance for user profiling, but obviously to capture activity stereotypes rather than activity snapshots as desired for general visitor awareness. The computer-supported collaborative work community (CSCW) studies awareness support as a means to initiate communication and collaboration in distributed teams. To this end awareness information is captured locally and transported to remote team members to be presented in real-time. The awareness information is typically event-based, for instance, arrival of a person as inferred from system login, or based on live video capture. In the first case, events are propagated through the network and displayed to potential collaborators in some form of iconic indicator (e.g. ). In the case of video, a range of methods has been discussed, including media spaces, periodic snapshots and video glances. Media spaces provide a continuous video view into a remote place, typically placed in a hallway or social room . Snapshots replace continuous video by low-fidelity images that are updated periodically, for instance, to convey who is around at the other end . Video glances are brief continuous video connections simulating the kind of brief look into a person's office that people take when they walk past or casually check who is around . The awareness support methods investigated in CSCW are typically aimed at well-defined groups or communities of people, such as colleagues and buddies. In the context of the World-Wide Web, the study of awareness has been extended to groups of people who are dynamically related via web places. Most of this work has been concerned with supporting awareness among the visitors that happen to be in the same place at the same time. In this context, awareness support is provided to facilitate social communication and collaborative browsing . An obvious example for facilitation of communication through web places are chat rooms. In more elaborate systems, audio/video connections are provided to virtually co-located visitors of a site, for instance, to augment web-based shopping malls with social exchange among customers . Quite surprisingly, while the visitor-visitor relationship has received a lot of attention, there is very little work on support of the host-visitor-relationship that we are concerned with in this paper. A noteworthy contribution however is that of Liechti et al. who introduced a wearable appliance designed to augment web hosts with continuous awareness of their web territory. In this system, web activity is notified with ambient audio, with additional awareness information being accessible through the wrist-worn appliance, which also enables initiation of direct communication with visitors . Awareness is a background task by its very definition. Hence, awareness information should be a presented in a way that does not conflict with foreground tasks but that is nevertheless easily accessible. Studies of awareness support systems for example report problems with desktop-based presentation of iconic indicators and video windows that compete with other applications for screen real estate and user attention, and that easily become obstructed by other application windows. An interesting alternative is to move awareness information off the screen and into the ambient environment. Apart from resolving desktop clutter, the appeal of ambient interfaces is that they engage users both at the center and at the periphery of their attention, as Weiser & Brown pointed out . This means ambient interfaces usually reside at the periphery of attention, but at any time users can move them into the center by explicitly attending to them. A number of projects have recently studied how ambient environments can be employed for presentation of information. The European project AROMA explored new display possibilities, focussing on abstract representations suited for display of information in the background of our attention. Their prototypes included, for example, armrests displaying information in terms of changes in temperature, and background animations of clouds drifting by at varying speeds [10,11]. Another well-known study is the ambientROOM, a mini-office installation equipped with a range of ambient media to explore how these can support the expression of digital information. The installation included water ripples projected to the ceiling, active wallpaper with light patches, and natural soundscapes with modulated density to display information such as number of unread emails, or amount of human activity in the workplace [7,18]. Both AROMA and ambientROOM have shown that the ambient environment is a display resource that lends itself to presentation of awareness information. The projects are also inspiring with respect to the design of ambient media devices that facilitate peripheral information display. An example is the Water Lamp, whose light shines upward through a pan of water which is actuated by changing information, producing changing light patterns on the ceiling of the ambientROOM. Other inspiring examples of ambient media are Natalie Jeremijenko's "dangling string", and Rodenstein's window display. The first is a piece of wire hanging suspended from the ceiling at Xerox PARC to display traffic load on the local computer network in terms of vibration . The latter is a transparent display augmenting a window for display of simulated weather conditions based on forecasts, leveraging people's association of exterior windows with the weather . Recently, ambient displays have also been studied in the specific context of awareness support systems. For instance, Kuzuoka and Greenberg have designed a number of Digital but Physical Surrogates which are tangible representations indicating activity and availability of remote people. Their peek-a-boo surrogate, for example, is a figurine that rotates to face away if the represented person becomes unavailable. The idea is further, that manipulation of the surrogates can facilitate the move from mere awareness to actual communication [5,8]. Earlier work on ambient media has mostly yielded one-of-a-kind installations. One of our goals was to advance this situation and to work toward general mechanisms for integration of ambient media with digital information. Figure 1 shows a sketch of the ambient media system that we have developed to this end. The system implements an open architecture for integration of non-computer artefacts as ambient displays of web-based activity. Based on this platform we have integrated a number of specific ambient media devices that support web awareness in our everyday work environments. Common gateway interface (CGI) to serve requests for ambient display. The use of standard web server and CGI facilitates universal access to ambient media. Web browser for access to documents in the web space which in turn triggers requests for ambient display. Non-computer artifacts integrated as ambient media devices, supporting information display through changes in their state and appearance. Media controller for each ambient media device integrated in the system. Media controllers have a software part implemented as CGI program which deals with display requests and keeps track of display state, and a hardware part for the actual device control. Web pages with such embedded links are accessed via the standard HTTP protocol (step 1 in figure 1). The server replies by delivering the document to the browser (2). The browser interprets the HTML code, and automatically triggers HTTP GET requests for the embedded images. By this means, the link to the CGI program is followed (3), and the CGI program executed. The CGI program determines the ambient display through control of the connected ambient media device. It does not return any data to the browser. For further exploration of ambient media in our everyday work environment, we have integrated three types of device in our ambient media system: lamps, a table fountain, and an ultrasonic humidifier as shown in figure 2. The lamps used as ambient media are closely associated with the artefacts they illuminate, in particular pictures and posters on our office walls and in the hallway. This is an example of exploiting affordances already available in the environment, and it also illustrates subtle augmentation of reality. The lamps facilitate ambient display of information by changes in light level, with media controllers for individual lamps as well as for groups of collectively controlled lights. Figure 2. In our office environment, non-computer devices such as lamps, a table fountain and a humidifier are integrated as ambient media for display of web-based activity. The table fountain and the humidifier are positioned in the immediate work space of the authors. The table fountain provides control over four pumps that can be switched on and off independently, supporting variations in ambient display. In our implementation, the fountain media controller is connected to the device via a parallel interface board, and supports 7 different display patterns with different degrees of transience. The humidifier in principle supports continuous change of its state but we use it primarily with a media controller that provides control over three states: off, pulse, and overflowing. The pulse and overflowing states lend themselves intuitively for display of bursts and unusually high levels of activity. The ambient media platform has been designed for flexible extensibility. Additional ambient media can be added by registering a CGI program for their control. In our architecture, CGI programs support abstraction from the actual ambient media devices. The CGI programs encapsulate how the devices are controlled. With this mechanism, any ambient media device can be integrated, provided it can be controlled through a defined interface. Very basic devices will typically be controlled by power-on-off. More generic devices may be controlled by the power supply (e.g. motor, lights) or by embedded micro-controllers, linked to the system via serial line or home bus. The presented architecture is clearly geared toward peripheral display of activity in the web, in particular monitoring and display of page hits and page hit rates. However considering the web itself as platform for arbitrary applications, the architecture may be used to support awareness of other kinds of activity, for instance file system events. Such applications would be facilitated by integration of event handlers that explicitly call CGI-programs for ambient display. For instance, in our ambient media environment we utilized the elm mail filter system to trigger calls to CGI media controller depending on evaluation of sender and subject fields. Earlier explorations of ambient displays have inspired their further exploration as media for peripheral information display and specifically as media in group awareness . In the latter context, it has been stressed that they provide a powerful alternative to desktop-based methods, as they do not compete for screen real estate and explicit user attention. This quality has also been exploited specifically for web visitor awareness in Liechti's system . In previous published work we have added two concepts to the available body of work, ambient links and ambient counterparts . Ambient links have been proposed to provide users with more control over the use of ambient displays to create their own web activity views dynamically. The notion of ambient counterparts has been introduced as foundation for activity views that support overview and comparison. Ambient links are a concept for empowering users to dynamically link web events of interest to available ambient displays. With respect to visitor awareness, our argument is that hosts should be empowered to focus their awareness depending on their tasks and priorities that may change over time. For example, hosts may like to be aware of activity in those parts of their site that have recently been added or modified. Hence, the hosts should be given some control over the configuration of web activity views, to enable them to direct their awareness. To this end web activity and its ambient visualization are clearly separated in our approach. The binding between the two is allocated in ambient links that can be anchored in web resources to connect them to a specific ambient media device. The anchor is a tag that triggers execution of a CGI script. As described in the previous section, the image tag can simply be employed for this purpose. Figure 3: An editor for user controlled creation and deletion of ambient links between events in the digital world and display effects in the physical work environment. The concept of ambient linking has been used by individuals in our work group for more than a year now to follow up on activity in their web spaces. 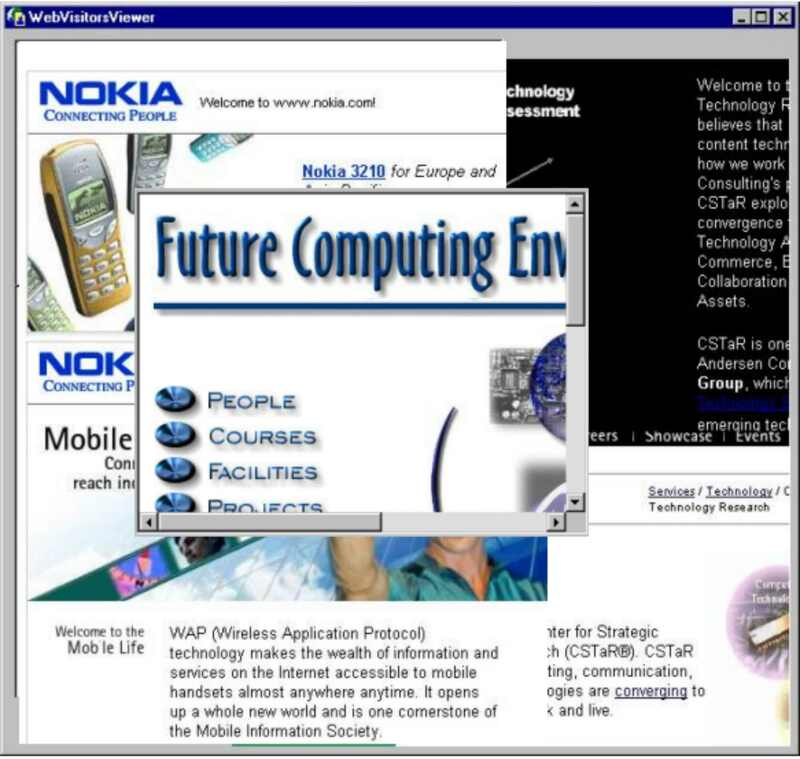 For a shorter period in 1999 ambient links were also used by a larger project group for awareness of activity in a conference web site. Experience indicates that user control over ambient media is useful for two kinds of application: the short-term assignment of ambient media for notification of anticipated events, and monitoring of processes that involve different information in successive phases. Short-term assignment of ambient media is frequently used to direct awareness to antiucipated events that users do not wish to go unnoticed. For example, one of the users developed the habit to use his table fountain to monitor access to documents he makes available to collaborating partners on a project web site. His fountain bubbles for a certain period after document access, and depending on his situation he may notice and then check who accessed, may notice and ignore, or may not even notice at all. Obviously, the the level of attention paid to the peripheral display depends on importance and concentration assigned to a foreground task. The flexibility of ambient links was further found useful for monitoring processes that involve different web activities at different stages. For example, in the context of a conference web site it makes sense to direct awareness to activity that matters most in the various phases of conference preparation. Specifically, we used ambient links first to monitor access to the call for contributions, then reassigned the link to tune in on submission activity, then review activity and at last registration. In all these phases it was never a problem to miss out on activity information at the periphery but it was always helpful to maintain a sense of how much activity occured. Ambient links connect web page hits to ambient display effects and hence promote primarily awareness of singular events, i.e. event notification. Use over longer periods may well convey overview information, such as how busy an area in the web is, but the ambient presentation as such does not provide any overview. To address this we have developed another web awareness method, specifically designed to convey overview and comparative information at a glance. The method is based on the concept of ambient counterparts previously introduced . Ambient counterparts are based on the observation that entities in web places often have objects in the real world as counterpart. The idea is to augment such real world objects as ambient display reflecting activity in the related area of the web. If we have a number of similar areas in a web place, and connect each area to a counterpart, then the aggregation of counterparts constitutes a display that supports comparison. This is illustrated in figure 4 showing an installation we built in our work environment to evaluate the concept. In this installation, project pages in our web site are related to project posters in our hallway. The posters are augmented with lighting to display activity in the related web space. The lighting is controlled by a CGI program and a micro-controller unit that increase the light level a fraction whenever a related page is visited, and that slowly decrease the light level over time (cf. for details). With the posters arranged along the hallway, the distribution of light conveys at a glance which projects are more popular with visitors than others. Figure 4. Comparative web awareness based on ambient counterparts: posters in our office hallway are illuminated to reflect activity in the related parts of our web site. Set up in the hallway, the poster-based activity view is accessible to the whole work group. Members of our work group walk frequently past the illuminated posters in their daily routines, which means that no explicit effort is required to stay in touch with the web activity information they convey. The information can be taken in literally as we walk by, and the effortless access and perception let the display remain at the periphery of our attention. The poster-based view has been installed in our work environment for over a year now and according to our experience it is very successful in promoting awareness in the periphery. All of our group get frequently exposed to the display in their daily routine, but basically never walk up to it intentionally to check its state. In contrast, visitors often stop in front of the posters, which frequently prompts casual interaction on matters of web access and relative popularity of projects. This is the case both with first time visitors who wonder about the different light levels, and with returning visitors with whom the novelty effect has not worn off as quickly as with us. Particularly interesting is the motivational effect the display has on the group. Similar to Liechti's observation with his personal web awareness system , our group experiences feedback on access to their web pages as very motivating. However, in our system motivation is not only drawn from notification that visitors are present but also from viewing how popular pages are in comparison to others, invoking a friendly sense of competition to keep project pages attractive. This experience suggests that comparative web activity views are useful for groups of web hosts, but we foresee other interesting applications, for example, in electronic journalism to provide ambient at-a-glance feedback on popularity of the various features and columns. The awareness support methods described in the previous section are useful for web hosts to maintain general awareness of activity in their places but they do not provide them with any information on who is visiting. We have developed a third web awareness method that is specifically designed to convey this kind of information. Moreover, this method can be extended to support the smooth transition from awareness to interaction with visitors. The method is called Glances into visitors' sites as it provides the host that is being visited with a brief view into the visitor's home, introducing reciprocity to the host-visitor-relationship. The method is based on the assumption that most visitors to a web site also have their own site elsewhere in the web. This is a fair assumption, for example, within academic and research communities. The idea is then to look up the visitor's site to take a snapshot that can be presented to the web host to convey information on the visitor. A snapshot may, for example, be the home page or a collage created from a number of pages. Such a snpahot is then temporarily displayed to provide a glance of where the visitor is from. A succession of visitors leads to a series of glances that, for instance, can be arranged in a display so that the most recent visitors are presented. Our prototype implementation of glances into visitor's sites uses log file information to track visitors back to their own sites. Using a PERL-script for each visitor, the IP-address is retrieved from the log-file. Based on the IP-address the script tries to obtain the domain and host name, and this is used to check whether they run a web server. The heuristic is to replace the first part of the name with "www", and to check for the presence of a web server. If this is not successful, then the name is reduced by one sub-domain, checking for web servers along the domain hierarchy until only the top-level domain is left. According to our experience, in most cases a web server is found based on this approach, hence enabling a glance into the visitor's site. The next step is to select a web page from the site as snapshot to represent the visitor and his intent. This is done by searching the visitor's place for information that relates to the information that the visitor has accessed. This reciprocal search is conducted by invoking a search engine using keywords of pages the visitor has browsed. For example, if a visitor accesses a page on web awareness for which keywords such as "ambient interfaces", "augmented reality" and so on have been specified, then his web site is searched for web pages containing these keywords. The result of this reciprocal search, i.e., the URLs of returned pages, is broadcasted in the web host's environment, as it may be of interest to a range of applications. A display realizing a glance into the visitor's site is here considered as one of such applications. The algorithm underlying the reciprocal search is detailed as follows:. broadcast the retrieved URLs on the local network. In addition to the search approach we have also prototyped a simple display to evaluate glance-based visitor awareness. The display program is written in Visual Basic using a web-browser component and a UDP-client component. On the display several browser components are arranged in overlapping areas (cf. screenshot in figure 5). When the UDP-component receives a URL over the local network, the page is retrieved and displayed in a browser window. The browser windows are selected in round-robin mode, with the most recent display in the foreground. Presently, the display is implemented on a dedicated computer screen in the office environment but it is anticipated that it would blend better into the background of our attention if it were implemented, for instance, as wall projection. In contrast to the ambient displays described in the previous section, this display has a control so that users can "scroll over time" to see who has visited in the past, and to use past visits like bookmarks. A straightforward extension would be to enable the display as portal to surf into displayed sites. This would facilitate smooth transition from background awareness to foreground interaction. Figure 5. Glances into visitor's sites: this awareness display conveys at a glance from where a web site has been accessed recently. The described display has been used for visitor awareness in conjunction with a conference web site, and with web-based course material. In the case of the conference, it provided organizers with feedback on which research labs showed interest in the conference call and the submission details. Mostly, this served for motivation, but in some instances it also guided the organizers to work in their field that they had not been aware of before. In the other case, course material was published on the web for students attending a particular lecture. With the use of the glances display, it turned out that the web site was not only frequented by the students but also by academics teaching in the same domain at other universities. In effect, the display helped the user find out who else is teaching in his area, and what relevant resources they have available. Overall, our experience suggests that glances into visitor's sites are a very useful and effective tool to support awareness within communities, as they guide web hosts to visitor's sites based on a notion of common interest. This introduces symmetry to the host-visitor-relationship, creating a situation in which both can learn from each other. However, implications will have to be investigated carefully, for instance with respect to privacy and intrusion (e.g. symmetry would invite self promotion by visiting others). In this paper we have motivated a different view of the World-Wide Web as activity space in which hosts have places and receive visitors. With this view as point of departure we have focussed on the host-visitor-relationship and investigated how hosts can be provided with more visitor awareness, drawing on concepts from areas such as ambient interfaces, augmented reality and awareness support systems. We have based our work on an open system platform for integration of ambient media devices with web spaces, and created an ambient media environment for deployment and study of web awareness support. In this environment, we have developed and worked with three specific web awareness methods that provide hosts with information on web activity at different levels of abstraction. The first method, ambient links, supports simple notification ('my web page is being visited') but in a flexible and user controlled way. The second method, based on ambient counterparts, supports overview ('my page is popular') and comparison ('I have more visitors than you'). And the third method, glances into visitor's sites supports more detailed information on visitors ('somebody from Media lab is visiting') and their related work. The discussed web awareness methods have been applied for a range of purposes in our work environment. Ambient links have been used in personal information management and in conjunction with a conference web service. In this context we found that flexibly assigned ambient media are well suited for notification of anticipated events, and for monitoring of processes that involve different information over time. With the more intentional use of ambient media in these applications, they were sometimes rather perceived as tool than as part of the environment. Nonetheless they remained in the background of the users' attention, and we observed that ambient display simply got ignored if foreground activity required their undivided concentration. Ambient counterparts have been studied in a web activity view, that demonstrates their collective use for the display of class-based rather than instance-based information, supporting comparison. The application led to interesting observations of how the group and visitors interact with peripheral displays, and of effects on group motivation. The group greatly valued the information that was made available via peripheral display. This is interesting, as in principle they could have accessed the same information from log files but had rarely done so. Obviously, it required the subtle presence of the information in their work environment to stimulate their own awareness and interest. Once this awareness was established, the ambient comparative view of web activity even stimulated a sense of competition within the group to keep their web pages interesting and accessible. The glances into visitors' sites that we have introduced in this paper approach web and visitor awareness in a radically new way. In the glances system, awareness is not just based on the local information captured during a visit (pages accessed, time spend, etc.) but in addition on information that is searched for at the visitor's home (information they have on their pages). On this basis, glances can convey an impression of who is visiting and what their interest is. Moreover, glances may support the transition from awareness to interaction. One can think of the glances display as portal to the community of visitors that a host has. The power of the glances lies in the introduction of symmetry to the host-visitor-relationship. This may be considered to be in conflict with the common perception of the web as a medium that people can surf anonymously. On the other hand, symmetry enables mutual awareness: visitors learn about hosts they visit, but hosts also learn about their visitors. This is quite fundamental for promoting more awareness of potential common interest among people connected through the web. As our experience shows, the glances can support community-building in this sense, even based on the simple prototype that we used for a first evaluation of the concept. In our prototype system we use heuristics for locating and searching the visitors to obtain URLs that establish symmetry in the host-visitor-relationship. However, given the power of symmetry we would propose to support it in more straightforward ways in the web infrastructure. This could be realized as protocol extension, introducing a new header field in HTTP requests that visitors would use to pass their home URL to the visited server. Visitors would then have control over whether they provide the link back or not. We would like to thank the student research assistents at TecO, in particular Wolfgang Reichling and Christian Decker, who helped with the implementation and operation of the system in our office environment. Bly, S., Harrison, S. and Irwin, S. Media spaces: bringing people together in a video, audio and computing environment. Communication of the ACM 36(1), 1993: 28-47. CoBrow - Pleased to meet you on the Web. http://www.cobrow.com. 2000. Dourish, P., and Bly, S. Portholes: supporting awareness in a distributed work group. In Proceedings of ACM Conference on Computer-Supported Cooperative Work (CSCW'92), Monterey, USA, 1992; p. 541-547. Gellersen, H.-W., Schmidt, A. and Beigl. M. Ambient Media for Peripheral Information Display. Personal Technologies 3 (4), December 1999, Springer-Verlag London: 199-208. Greenberg, S. and Kuzuoka, H. Using Digital but Physical Surrogates to Mediate Awareness, Communication and Privacy in Media Spaces. Personal Technologies, 3(4), December 1999, Springer-Verlag London: 182-198. Ishii, H., Wisneski, C., Brave, S., Dahley, A., Gorbet, M., Ullmer, B., and Yarin P. ambientROOM: Integrating Ambient Media with Architectural Space. CHI'98 Video Program; ACM Press, New York. Kuzuoka, H.. and Greenberg, S. Mediating Awareness and Communication through Digital but Physical Surrogates. CHI'99 Extended Abstracts, Pittsburgh, May 1999; ACM Press, New York: 11-12. Liechti, O., Siefer, N. and Ichikawa T. A Non-obtrusive User Interface for Increasing Social Awareness on the World Wide Web. Personal Technologies 3 (1&2), 1999, Springer-Verlag London: 22-32. Pedersen, E.R. and Sokoler, T. Awareness Technology: Experiments with Abstract Representation. Proceedings of HCI International '97, San Francisco, August 1997; Elsevier Publishers. Pedersen, E.R. and Sokoler, T. AROMA - abstract representation of presence for the purpose of mutual awareness. Proceedings of CHI '97, Atlanta, 1997; ACM Press, New York: 51-58. Rodenstein R. Employing the Periphery: The Window as Interface. CHI '99 Extended Abstracts, Pittsburgh, May 1999; ACM Press, New York: 204-205. Schmidt, A., Gellersen, H.-W. and Beigl, M. Matching Information and Ambient Media. In Proceedings of the Second International Workshop on Cooperative Buildings (CoBuild'99), Pittsburgh, PA, USA, October 1999; Springer-Verlag, Heidelberg. Sidler, G., Scott, A., Wolf, H., Collaborative Browsing in the World Wide Web. Proceedings of the 8th Joint European Networking Conference, Edinburgh, May 12.-15. 1997. Tang, J., Isaacs, E. and Rua, M. Supporting distributed groups with a montage of lightweight interactions. In Proceedings of ACM Conference on Computer-Supported Cooperative Work (CSCW'94), Chapel Hill, USA, 1994, p. 23-34. Wax, T. Red light, green light: using peripheral awareness of availability to improve the timing of spontaneous communication. In Short Paper Proceedings of the ACM Conference on Computer-Supported Cooperative Work (CSCW'96), Boston, USA, 1996. [Wis98] Wisneski, G., Ishii, H., Dahley, A., Gorbet, M., Brave, S., Ullmer, B. and Yarin, P. Ambient Display: Turning Architectural Spache into an Interface between People and Digital Information. In Proceedings of the First International Workshop on Cooperative Buildings (CoBuild'98), Darmstadt, Germany, February 1998; Springer-Verlag Heidelberg, p. 22-32.